Motion Technologies has released a new design concept that integrates a worm drive gear with a slew ring. Called Drive Slew Rings, this product is ideal for use with high torque hydraulic motor or geared electric motors. 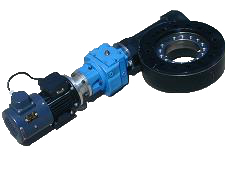 They are available in 5 frame sizes from 3000 to 20,000Nm output torque with enclosed or open gearing and diameters from 300 to 700mm.